We're quickly getting inspired for Fall. It was bound to happen, it's my favorite season and I'm always more than ready for it by the end of August. There's a new project beginning in September that we're pretty excited about, i'll be doing recipe posts once a week for the Free People blog (check out their recent home tour they did of our place!). We've already got one recipe and photo shoot in the bag, and there are a lot more to come. Since Fall has already begun in the kitchen for that project, we thought sneaking in a few end of Summer favorites would be appropriate. In terms of the good old Cobb salad this isn't particularly traditional, naturally. 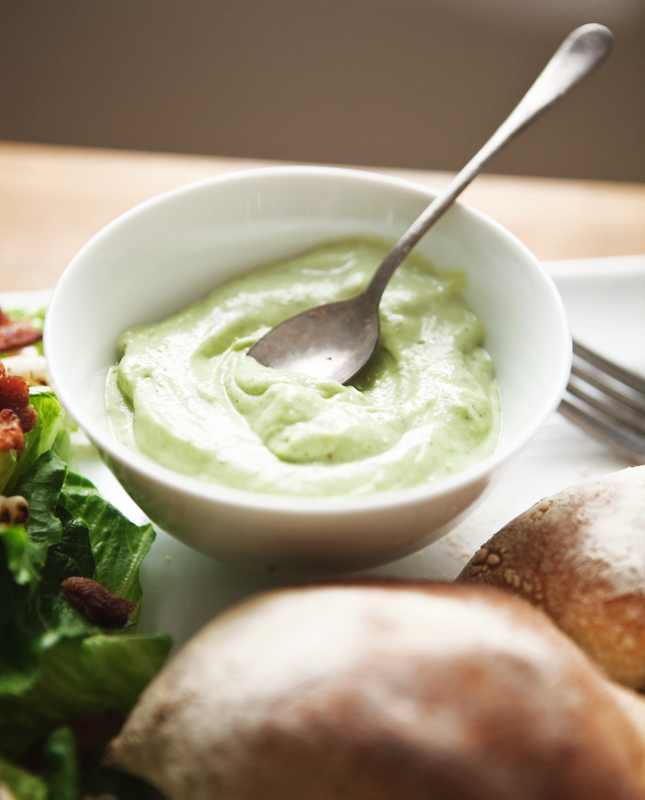 We served the Green Goddess Dressing on the side for dipping. It made the bread disappear quickly and the salad taste like Summer. The avocado adds creaminess without feeling too heavy and you'll want to devour the whole bowl. We snuck some grilled corn in there as well, a nod to warm weather while we start brainstorming for the cooler season ahead. To assemble salad, arrange lettuce on plate and top with avocado, tomatoes, eggs, corn, chicken, and crumbed bacon. Garnish with chives to your liking. Serve with the Green Goddess dressing on the side for dipping, and a good loaf of bread.